Are you as Krazy for Kraft as I am? I love it. Kraft cardstock is my go to product. I stamp on it all the time so I was very excited to be a part of this fun hop. Look what I made! 1. I started with a kraft base measuring 10" x 4" and folded it in half. The edges are inked in brown ink. 2. The orange patterned paper is cut at 4.5" x 3.5". The edges are inked in brown and it was glued to the base. 3. I stamped 3 of the wheat stalks one each in green, orange, and brown on kraft cardstock. I used a postage stamp punch to punch all of them out then inked the edges in brown. They were adhered to the card using foam tape to pop them up. 4. I cut a strip of kraft cardstock measuring 4" x .5" and stamped my sentiment. The ends were "V" cut and the edges inked in brown. 5. Last but not least is a raffia bow to finish the card. I think it turned out so pretty. I hope you like it too. Now on to the hop! Your next stop is Emily Daniels blog. Click the link above and you'll be on your way. If you need to start from the beginning go to the Denami Design blog by clicking HERE. Make sure you complete the hop and leave comments on all the blogs so you have a chance to win a $20 gift certificate to the Denami Design website. You have until September 9, 2013, 11:59 pm PST to get your comments in. Thank you so much for hopping by today. Follow me and check back soon for more crafty inspiration! Kerri, what a gorgeous Thanksgiving card! I love those wheat stalks! Beautiful! The wheat stalks are perfect in this design. I never thought of the wheat stalks for the focal point, but they look perfect in this design... Perfect for the fall and Kraft card stock! Lovely card and layout!! The wheat stalks are on my wishlist. I love the rustic/fall look of this card. Great job! The layout is great too! I think I actually have everything to make this beautiful card...starting to love Kraft, more and more! wow---great card! definitely going to card-lift this one! Kerri, this is so nice! I love the color choices, the patterned paper, raffia and the use of the wheat stamp...even though I'm not quite ready for Thanksgiving yet!! Great job! Oh! This is nice! I forgot about these adorable wheat stalks! Very nice card! Excellent hop! Thanks for the inspiration. I enjoyed the symmetry and design of your kraft project. I've created a project for this hop as well, hope you stop by and leave a comment as well. Take care. Kerri I love the fall homespun feel to your card! Thank you for sharing your totally TERRIFIC fall card! Have a GREAT week! Your card is beautiful. I could see giving this to someone with an apple pie. GREAT inspiration. Thanks so much! Great thanksgiving card! I love the fall colors. Lovely thanksgiving card. I like the paper you used and the wheat stalks. LOve this card, the wheat stalks are one of my absolute faves!! This just makes me happy! Absolutely BEAUTIFUL Autumn-themed card!! The colors, the layout, the images----gorgeous combination!!! Oh, this makes me want a pumpkin spice latte and some apple cider donuts! So perfect for fall! This card is beautiful. I think kraft paper is perfect for fall cards! Wow! 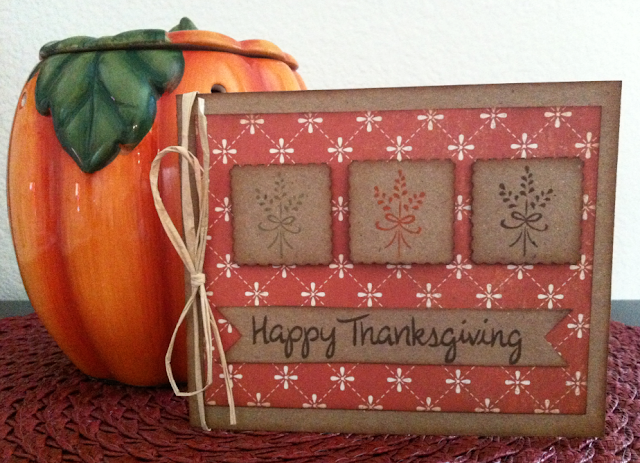 Super great fall card with great fall colors! Thanks for sharing! What a lovely design! So perfect for autumn. I about how you used kraft in this lovely card. I love this card! I have the small wheat stamp & you've inspired me to get it out!